How do you make a smartphone different? Over the past decade, smartphones have evolved so that there’s little room for surprise anymore. Maybe a processor jump here, and weird camera set up there. But for the most part, smartphones across the board can feel painfully similar. 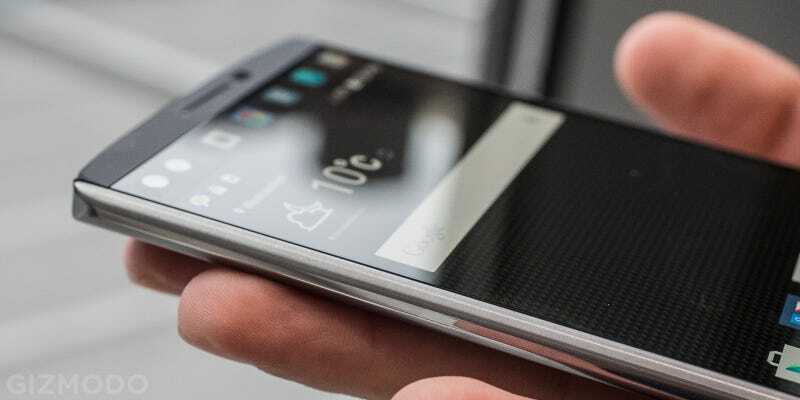 But then there’s LG’s new V10. Despite the strange naming convention (where is V1-9 exactly? ), V10 is an all-new lineup that’s even more swank than LG’s G series flagship. It’s slightly bigger at 5.7-inches, but powered by a Snapdragon 808, with a removable back (with expandable storage), a 3,000mAh battery, and a 16MP camera—all things we saw on this year’s G4. But that’s pretty much where all the normalcy ends. Picking up the V10, the first thing you notice is its substance. This phone feels incredibly solid with a decent amount of heft. It’s a little heavier because of its stainless steel and silicone/plastic design, but it’s about the same weight as the iPhone 6s plus, which LG admits is the exact smartphone they’re gunning for. Design-wise, the phone is set apart from the G series by two stainless steel grips on the side. The back is silicone plastic that’s removable. Honestly, it feels like the Droid-ification that every Motorola phone goes through every year for its Verizon-only smartphones. Except LG is transforming the G series, and it’ll be available to AT&T and T-Mobile as well. But it’s that same rugged design, clashing metal with some other material, that makes the V10 stand out from almost anything else out there. After you get past the incredibly solid build quality, your eyes will be drawn to the V10’s super-strange second screen. Although it’s constructed to look like one sheet of glass, the second screen resting on top of the QHD display (513 PPI) is actually powered by a separate backlight. In just the short time I spent toying around with the second screen, I equally loved it and hated it. Let me explain. Several times when I wanted to just get to the Settings app, I actually used the second screen to get to it quickly instead of hunting around my app drawer. That’s great, and shows that the philosophy behind the second screen works. It helps you navigate your phone with just a little less effort. But it has some problems, too. The biggest one being placement. I’m not in love with 5.7-inch phones. I’ve always thought that between 5-inches and 5.5-inches was the sweet spot for most. Although LG does a great job keeping the top and bottom bezels thin by moving the power button to the back, much like the G4, it’s still a big phone made bigger by slapping on second display. In fact measuring from the bottom left corner to the upper right, the screen is actually 5.9-inches. Because you have to stretch your hand so much to even reach that second screen, it makes it a little bit awkward and inconvenient to reach. The second problem is its always-on mode when the display is turned off. Like the Moto X for example, the V10 uses a low power mode to always show the time and notifications you have on your phone, but the V10 stops short of actually showing you what those notifications are. If you get a tweet for example, the icon will pop up but you can’t read it from the lock screen like you can with Moto Display (and now the new Nexus phones). So it’s an added convenience that stops short of being a throw-money-at-screen, must-have feature. That’s impressive. I’m not exactly a selfie (or even groupie *shudder*) type of person, but if you are, man, this is pretty great. It’s also within this camera app that LG spent a ton of time developing with that second screen in mind. In the app, editing tools fill out that screen, especially when you’re in manual mode—one of my favorite features on the G4 (and also one of the best smartphone cams out there.) The camera app will also learn your sharing habits and pop up with social media, SMS, or email options right after you take a photo in a small bubble, similar to a Facebook Messenger chat head. LG also packed in a bunch of easy-to-use video editing tools to make clips from long videos, but that definitely feels like one of those features that sounds good on paper but you’ll never really use. The big question here is price and availability. What we do know is that the V10 is meant to be a premium smartphone, even more so than the G series, and that it’s competing against the iPhone 6s, so you can expect to drop a healthy amount of cash. The V10 is also expected to be available in the U.S. sometime this November. What I love about the V10 is that it’s something different than the endless parade of slab phones we tend to see month after month after month. It may not be quite the weird you’re looking for, but hopefully the V10 remains a hardware playground where LG tests its fever-dream ideas. Who knows, maybe someday one of them will stick.